Geodemographic classifications are small area classifications of social, economic and demographic characteristics. The Output Area Classification (OAC) is a free geodemographic classification. It is an Office of National Statistics validated measure that summarises neighbourhood conditions at the Output Area Level across the United Kingdom. Linkage of these valuable statistics has been problematic for users more used to address records that are georeferenced using unit postcodes. OACoder resolves this problem by allowing users to link corresponding OAC codes to each of the postcode addresses. OACoder is an open source software, and it is developed and tested to work on different versions of windows operating systems. It is stored in Figshare. The source code of the OACoder is stored in SourceForge. As open source software, OACoder has reuse potential across a range of applications. The functionality of OACoder can be extended to work with the new version of OAC (2011 OAC). It is also possible to reuse the source code and extend the functionality to work on different operating systems other than Windows. Different components of the software can be reused for the purpose of reading/writing CSV files and handling large data sets. However, the Output Area geography has been devised by ONS for the single and explicit purpose of disseminating results of the UK Census of Population. By contrast, address records typically consist of lists of unit postcodes. It is possible to match unit postcoded records to the OAC by using database software. But it requires knowledge of database programming, and there is no software utility which could be used for a simple match of the postcodes to their corresponding OAC codes. Recently, Office of National Statistics (ONS) has created an open license version of the National Statistics Postcode Directory (ONSPD: ), which includes an OAC Code for each unit postcode in the UK. The OACoder software uses the ONSPD and allows the users to read in a CSV file with list of postcodes. It then appends the corresponding OAC code for each of the unit postcodes. For this paper, we have used the latest version of the ONSPD available (snapshot date: November, 2012). OACoder is written in Java. It uses the standard Java packages to read in a CSV file containing unit postcodes, codes each unit postcode to the corresponding OAC category, and then writes each of the resultant records into a separate CSV file. OACoder is an open source software and is stored in Figshare (http://dx.doi.org/10.6084/m9.figshare.156599). The source code of the software is stored in SourceForge (http://sourceforge.net/projects/oacoder/). As an open source software, OACoder has reuse potential across a range of applications. This paper discusses the development and reuse potential of the OACoder software. It outlines the architecture of the software, the testing procedures applied in its development, and the suitable operating environments for running the software. Finally, the paper explains the reuse potential of the different components of the OACoder. OACoder was implemented by using the object oriented paradigm, which in practice begins by dividing the software into small components (called Classes). In the later stage, each component of the software is developed. In an object oriented paradigm, a class diagram is a good way to show the relationship between different components of the software. A class diagram shows the classes that make up a system and the static relationships between them. Classes are defined in terms of their name, attributes (or data), and behaviours (or methods) . The static relationships are association, aggregation, and inheritance. In a software engineering process, after the architecture of the software has been finalised the next step is to choose an appropriate development technology. A range of development technologies are available for different operating platforms. These include Java, .NET (VB.NET & C#), Visual Basic, and C++. Applications developed in Visual Basic, VB.NET, C++, and C# run only on windows operating systems. However, Java could be used for developing cross platform applications. It means that applications developed in Java can run on different operating systems e.g. Linux, Unit, Mac OS, and Microsoft Windows. So, Java was chosen for the development of OACoder. In the future, the functionality of the OACoder can be extended to work on other operating systems e.g. Linux, Unit, Mac OS. OACoder requires Java 1.5 or higher installed on the computer. OACoder requires a minimum of 4GB memory installed on the computer. The use of a Dual Core or higher processor is recommended. OACoder does not have any dependencies on other libraries. OACoder uses the standard Java packages, so does not need any additional libraries or frameworks. Extension of OACoder to work on other operating systems: A possible enhancement in the functionality of OACoder is to reuse all of its source code to work on different operating systems. OACoder is developed and tested on the Windows operating systems. However, applications developed in Java can run on multiple operating systems. Mac OS and Linux are used quite extensively in research these days, and the ability for OACoder to run on multiple platforms will increase its user base. Use of OAC 2011: OAC was developed by using 2001 census data. A new version of OAC based on 2011 census data will soon come out, keeping in mind that ONS has already started the consultation. The new ONSPD data based on OAC 2011 will replace the existing ONSPD data. Hence, a possible reuse potential of OACoder is to reuse its source code and extend the functionality to work with the new version of ONSPD dataset. Reading/Writing CSV files: CSV file format is quite popular in research and thus researchers and developers need source code to read and write CSV files. OACoder has separate components for reading and writing large CSV files. These components can be reused to read/write CSV files for different purposes. Handling large data files: Source code in OACoder could also be reused to read and write large data files. OACoder reads a user file containing a list of postcodes, and matches it to a list of 1.8 million postcodes in the UK. OACoder does this very efficiently and quickly. This source code could be reused for potential applications where an efficient read/write is required for large data files. Office for National Statistics. National Statistics Postcode Directory. Available at: http://www.ons.gov.uk/ons/guide-method/geography/products/postcode-directories/-nspp-/index.html [Last accessed 15 February 2013] . Copeland, L (2008). 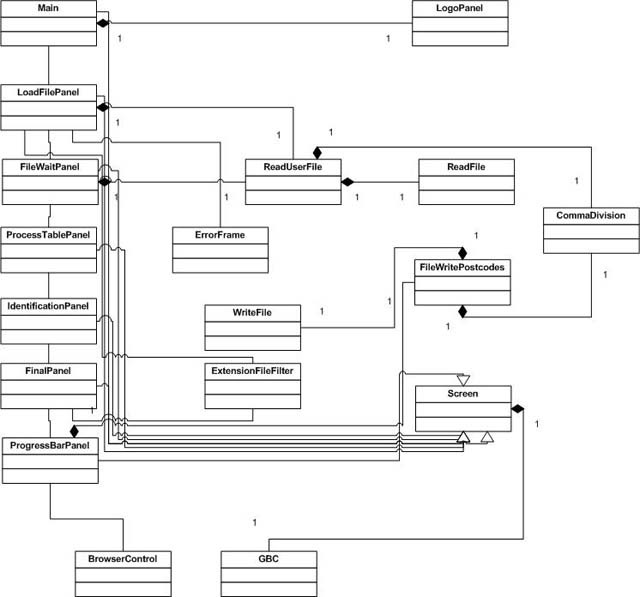 Testing UML Models. Available at: http://www.stickyminds.com/sitewide.asp?Function=edetail&ObjectType=ART&ObjectId=6232 [Last accessed 15 January 2009] .